rain tumors are common in over 200,000 cases annually. Each type of brain tumor is unique with signs and symptoms from blurred vision, mobility function, personality change, seizures, and sleepiness. A brain tumor develops when there is normal or abnormal cell growth. A medical diagnosis then would indicate the cell growth as noncancerous (benign) or cancerous (malignant). Doctors must also evaluate if the tumor is low-grade (1-2) or hi-grade (3-4) and slow-growing or rapid growing. This is called the stage or classification. A myriad of brain tumors get their name from the type of cell that the tumor forms inside and the classification system. 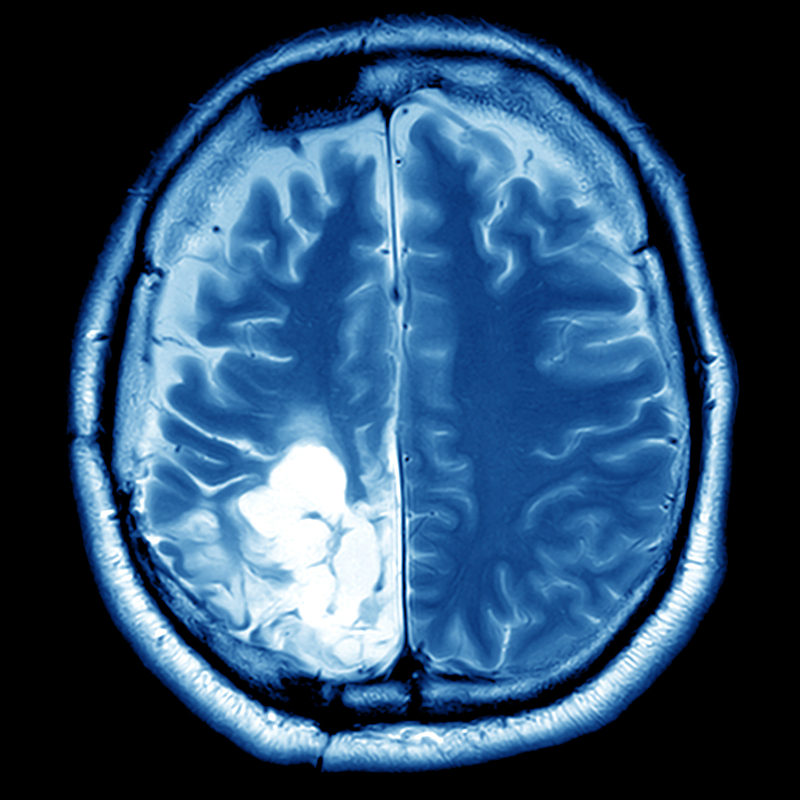 Brain tumors can be primary tumors, which form first in the brain or secondary tumors, known as metastatic, which form in other parts of the body before spreading to the brain. Primary tumors are less common than secondary tumors because not all brain tumors are cancerous. An example of this is meningiomas, formed in the meninges. Pituitary tumors can develop behind the pituitary gland, which controls function of the thyroid gland, adrenal glands, ovaries, and testicles. These types of tumors are typically benign and occur in approximately 10,000 Americans annually with a low cancer rate. These tumors include adrenocorticotropic (ACTH), growth, prolactin, and thyroid stimulating or hormone-secreting tumors. Gliomas are primary tumors categorized in different stages that can form in various lobes of the brain. A low-grade glioma is typically stage 1 or 2 whereas a glioblastoma (glioblastoma multiforme) is considered a highly aggressive stage V tumor known to form in the frontal and temporal lobes of the brain. Astrocytomas are part of a large group of glial brain tumors. Astrocytoma is a malignant tumor formed from glue-like supportive tissue in the brain called astrocyte. This type of brain tumor is commonly found in the cerebellum, cerebrum and brainstem. A myriad of brain tumors get their name from the type of cell in which the tumor originates. The elite team of board-certified brain neurosurgeons at North Jersey Spine Group (NJSG) understands how the diagnosis of a brain tumor can drastically impact a patient’s life. Through their practical approach, NJSG neurosurgeons assess each brain tumor and have the patient understand the significance of their tumor. A patient is then given treatment options such as chemotherapy, radiation or surgery to ensure the best possible outcome. Using the most advanced proven technology a patient will receive exceptional and compassionate care. With multiple facilities spanning Bergen County to Essex County and surrounding towns including Ridgewood, Kinnelon, and Montclair, NJ, patients in Northern New Jersey trust NJSG to handle mild to serious brain disorders and conditions and can expect the most favorable outcome.